Overview of Thinkific: What is Thinkfic exactly? 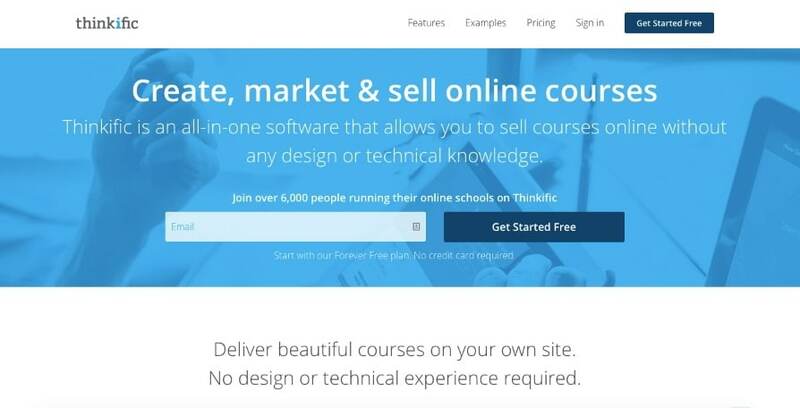 Thinkific is a platform that allows you to create and deliver online courses. Once you have created your courses, you can sell them or deliver them using your own brand. There are many global corporations that have been using Thinkific to create courses, and it is in use in over 70 countries. One of the key benefits with this platform is the fact that you can customize the online learning experience and allows you to include payment options. Both instructors and students will have a great learning experience through Thinkific. If you have existing courses or want to create new ones, you should consider the tools that are provided by Thinkific. The process of creating a course is simple and straightforward; all you need to do is drag and drop your material that you would wish to share with your students. The content can be in the form of video, PDFs, audio and so many more. With Thinkific, you can include discussions, surveys, quizzes and any other form of content that that you would need to complete your course. Simple Launch: With Thinkific, you will be able to launch your online courses within a few minutes. The platform is easy to use, but has powerful elements, to support even demanding courses. Create Multimedia Courses: Thinkific gives you the option to create your courses from any type of content. You can use PDF, video, text, audio and HTML to build diverse multimedia content. Easy Import of Courses: The drag and drop course creation feature will allow you to import your courses easily. Voice-over Slide: If your course is made up with slides, there is a tool that will allow you to record an audio narration. This can be used for presentations using Keynote and PowerPoint. Retain Content Rights: You will retain the rights of content and grow your brand. You can use Thinkific to create professional online courses easily. With Thinkific, you will get access to all the basic information of all your students, including names, phone numbers and email address among others. Thinkific has the capacity to handle all sorts of course, even the ones that are demanding. There is exception technical support and this will allow you to keep your audience on your website such that you will grow your own brand. You can create multimedia courses from any type of content. The marketing efforts are solely upon you and as such the success of your online courses will depend on your marketing strategies. The price factor seems to be higher than other online course marketplaces like Skillshare and Udemy. Thinkific seems to be a nerdy one and has some bit of technicality. Besides the price that you will pay for platform, you will need to invest more time and resources to promote your courses. Everything you need to create/market/deliver courses online. If you are looking for a platform through which you can build your online courses, while growing your brand, Thinkific is the option to consider. You will have full control of the information on all your students. This is an ideal platform for experienced instructors who want to advance their teaching careers. Thinkific is self-hosting, and as such, all the information will be on your website. There are marketing efforts that would be required so as to sell your courses and as such, it may not be suitable for beginners. You can now share all your courses through this dynamic platform, and you can choose the price plan that suits your needs.